Photodynamic light therapy is emerging as an effective treatment for a variety of dermatological conditions, ranging from cancers to common wrinkles. The Bio Light Cell Modulation system is based upon two complementary methodologies. It draws on the principles of photodynamic light therapy, delivered via light emitting diodes, in addition to electrotherapy. When micro-current electrotherapy is combined with LED therapy, a physician can safely administer a variety of effective, non-invasive skincare treatments. The Bio Light system takes its cue from plant photosynthesis, during which precise light wavelengths activate specific biochemical agents. Different light wavelengths precipitate specific chemical reactions in human skin and muscle tissue. Using four phases, or colors, of light, the 2596 LEDs in the Bio Light Cell Modulation system produce a range of chemical reactions that reduce or eliminate numerous cosmetic conditions. 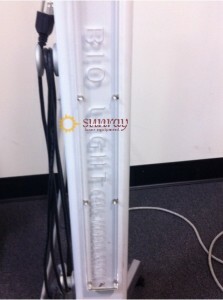 SunrayLaser.com specializes in a full range of aesthetic medical devices, including the LED-based technologies represented by the Bio Light Cell Modulation system. Our price quotes are always competitive, and just a moment away. Simply contact us via the form below to determine if the Bio Light is the right fit for your clientele! SunrayLaser.com welcomes Bio Light’s innovative photo-modulation technologies to our lineup of refurbished aesthetic medical systems. Our reputation for delivery of high quality, effective, groundbreaking therapeutic dermatological equipment is unsurpassed. Our professional device technicians have methodically refurbished each Bio Light Cell Modulation device held in our inventory. We do not ship any device without our guaranty that it will operate at its stated equipment specifications. SunrayLaser representatives are always ready to “talk laser” or discuss the resurgence of LED therapies such as those delivered by Bio Light. Please take a few seconds to enter your data in our short contact form, and one of our knowledgeable representatives will be in contact. We are happy to provide price quotes and field questions about our devices and superior service.